Among the world's most advanced ground-based air defense systems, the Patriot Air and Missile Defense System is in service to the United States and other nations. The missile system, produced jointly by Raytheon and Lockheed Martin Missiles and Fire Control, was a notable feature in the Persian Gulf War of 1991 and Operation Iraqi Freedom in 2003. Since 1991, the U.S. Department of Defense (DOD) has spent more than $3 billion in further improvements. As effective as the Patriot has been, however, its record is not flawless. Among the most significant aspects of the Patriot missile system are the multifunction phased array radar, the track-via-missile guidance with midcourse correction commands and ground radar downlink, and the human override to its automated operations. The system also includes an engagement control station, electronic power plant vehicle, as many as 16 remote launching stations (each with four Patriots ready to fire), and an antenna mast group for communications. 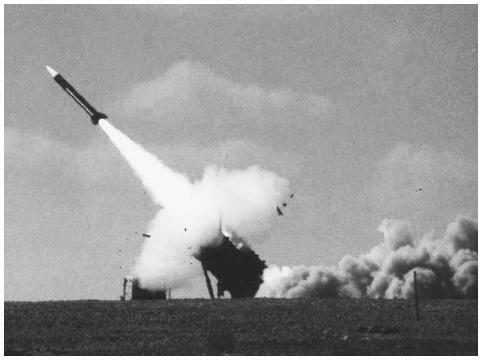 In the Persian Gulf War, allied forces used the Patriot to stop Iraqi Scud missiles, particularly when Saddam Hussein's military fired on Israel. After the war ended, DOD invested in numerous upgrades such as the development of the Patriot Guidance Enhanced Missile Plus (GEM+), which includes a new fuse and a low-noise front end that increases the sensitivity to low radar targets. With 148 missiles contracted, Raytheon delivered the first GEM+ models in November 2002. 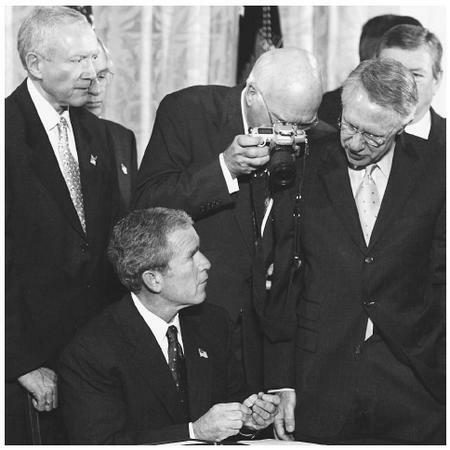 Senator Patrick Leahy (with camera) peers over the shoulder of President Bush during a ceremony for the signing of the Patriot Act in the White House East Room in October 2001.
with two airmen aboard on March 23, 2003. Aside from the United States, nations that possess Patriots include Germany, Japan, Israel, Saudi Arabia, Kuwait, Taiwan, Greece, and the Netherlands. Patriots have also been cleared for sale to Egypt. Kilian, Michael. "Patriot Missile Miscalculations a Cause for U.S. Concern." Chicago Tribune. (March 27, 2003): 5. Marshall, Eliot. "Patriot's Scud Busting Record Is Challenged." Science 252, no. 5006 (May 3, 1991): 640–641. GAO Report: Patriot Missile Defense. Federation of American Scientists. < http://www.fas.org/spp/starwars/gao/im92026.htm > (April 7, 2003). Patriot Missile Air Defense System, USA. Army Technology. < http://www.army-technology.com/projects/patriot/ > (April 7, 2003). A Patriot anti-missile missile is launched during a 2001 joint Israeli-American military exercise in the Negev Desert in southern Israel.